It seems that most every wedding ceremony that I have been to include a story that is pretty funny. Ours turned out to be no exception. The park we married in was part of a retirement community. As Dan (the minister) was talking to us about marriage we had a gentleman come along the path in the park. As he neared he came up to a couple feet from Jenny's shoulder. I thought at the time he was going to ask what was going on. He just stood there for a short while listening in, then walked off. After the ceremony we were all laughing about the event. Dan speculated that perhaps the man was a retired minister himself and wanted to make sure that it was being done right. We all kind of chuckled about it and then later greeted the gentleman as he left the park area. What none of us realized is that after he appeared to have left, he came back. 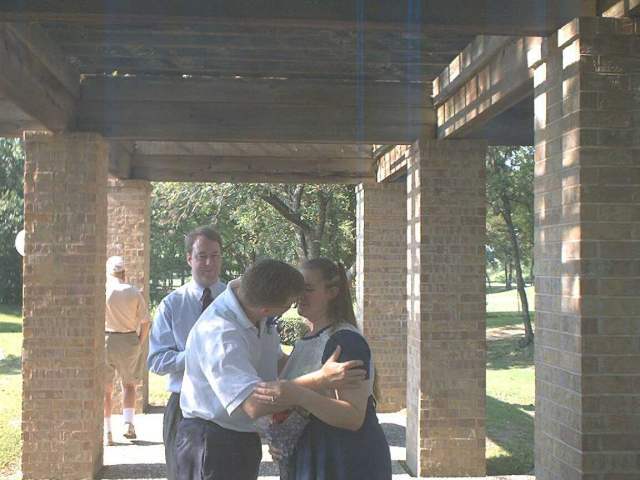 He is captured in the background of the picture of the wedding kiss. Just to the left of me he has his back turned away trying to look nonchalant.